Hallowe'en outdoor outfit and big carpet bag for treats. "You'll just pamper Anne's vanity, Matthew, and she's as vain as a peacock now. Well, I hope she'll be satisfied at last, for I know she's been hankering after those silly sleeves ever since they came in, although she never said a word after the first. The puffs have been getting bigger and more ridiculous right along; they're as big as balloons now. Next year anybody who wears them will have to go through a door sideways." Hallowe'en dress for the class party. Well done Deb, this is my favorite costume so far! (could you make me on as well?! ;-) } I adored these books as a child and read them to Sarah too. They are wonderful and these pictures are so cute. I love that you made to of the dresses. 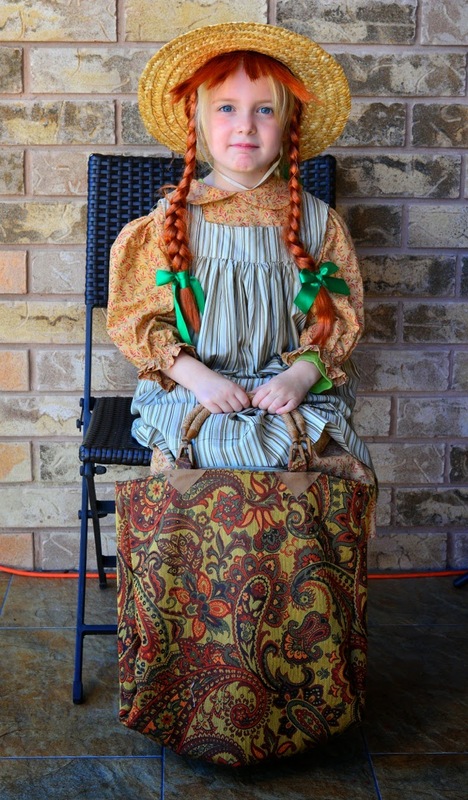 I love kids dressing up as characters from books. I bet she is going to have fun! This is so great! And the carpet bag just puts it over the top. I must read this story! My daughters eyes are green in some lights/moods and grey in others. This has made me think of her!